"I hate cooking after work! This can be a great quickie side or main dish depending on your appetite and/or level of laziness. It's also a bit healthier, as I used smoked turkey leg instead of pork. Hope you enjoy!" Heat olive oil in a large skillet over medium heat. Cook and stir turkey in hot oil until warmed, about 3 minutes. Add onion; cook and stir until hot, about 1 minute. Reduce heat to medium-low. Pour chicken broth over the turkey mixture; stir. Bring liquid to a simmer and cook, stirring occasionally, for about 3 minutes. 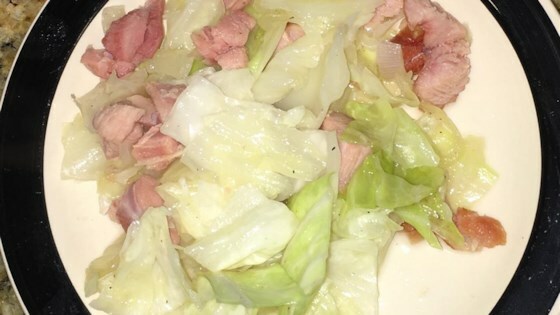 Stir cabbage with the turkey mixture; season with salt, pepper, and togarashi; cook and stir until the cabbage has begun to soften, 2 to 3 minutes. Reduce heat to low, place a cover on the skillet, and continue to cook until the cabbage is completely tender, 2 to 3 minutes more. See how to deep fry a crispy skinned turkey in 45 minutes or less! I have a gas stove. If you're cooking on an electric, you may cook for a bit longer, but not much. Keep a close eye on your heat and stir attentively. I prefer pulling my cabbage off of the heat a bit early to maintain some of the original crispness of the leaves. If you like a more soft cabbage, cook until your liking.